You often hear the phrase “child’s play” bandied about when something is deemed easy or unimportant. In reality true child’s play is anything but. Play is the means by which children explore their worlds and make sense of their surroundings, which is what ultimately informs their worldviews and opinions. What may look like frivolous activity to some adults is actually very important research on the child’s behalf. From birth, children begin to interact with the world around them. Even infants in a crib begin to recognise feelings such as hunger, pain and discomfort, and as they grow children are more able to interact with their surroundings and make sense of what causes pleasure and pain, what sounds nice and what sounds terrible, what smells good and what smells bad. Children use all of their senses to understand their surroundings, and as they play they physically use their bodies to roll, crawl, walk and run. What may look like a silly activity to some adults is actually engaging the child’s senses, physical skills and mental abilities. That’s a lot of work for something that is supposed to be fun and easy! Quiet. These activities can often be conducted in one place, such as looking at books or working with blocks. Children do not need great amounts of energy for quiet play and these activities are especially useful when a child is tired. Creative. These activities allow a child to engage his/her imagination through painting, dancing, sculpting with clay and much more. Creative play allows children to come up with their own worlds, and many children enjoy being in charge of these activities. Active. 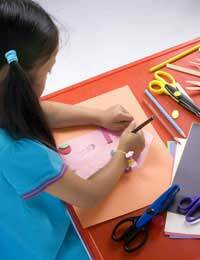 These activities require a good amount of energy and often help children develop their gross and fine motor skills. Playing with balls and climbing frames are examples of active child’s play. Cooperative. These activities involve more than one child. When children play with others and share their toys or take turns in an activity, they engage in cooperative play. Dramatic/Role playing. Like creative play, children engage their imaginations during dramatic play or role playing and often take on the persona of a different character. Some dramatic play may take place with other children, though it might also include toys, dolls or even imaginary friends. Singing silly songs and nursery rhymes with young children. Reading to children of all ages. Taking part in their children’s tea parties, school days or whatever other imaginary events they have dreamed up. Dressing up in “costumes” and performing plays written and directed by their children. Kicking or throwing a ball in the garden or park. Playing “I spy” while out on walks or long drives. Building towers of blocks or sand castles at the beach. For many parents, child’s play may seem lovely though relatively unimportant. If you find yourself wondering at the hours your child can spend engrossed in play, remember that (s)he is actually learning all about the world through these activities. Don’t wait for your child to invite you, join in and enjoy yourselves together! All the play that children do is an exploration the world and a way of mapping it. They take from things they’ve learned and apply them. Whether doing it quietly or loudly, they’re learning, especially small children – and they’re the ones who’ll play most. It can also be a way to understand relationships.